[CASE STUDY] How AVON increased its sales by 150%? Nowadays there are thousands of ecommerce stores present on the domestic market. Although their size and focus varies, there is one thing that most of them have in common: 98% of their visitors leave the website without buying anything, in spite of this fact, that the owners of these websites typically spend a lot of time, energy and money to attract visitors. The main reason behind this is that many of these visitors are simply not ready to buy anything yet, whereas others are only visiting the site to collect information for future purchases. But what can we do in order to make these visitors stay and not let go of them until they have been identified? This is the point where onsite retargeting comes into our marketing strategy. By tracking the behavior of visitors, onsite retargeting can help to communicate to them the most suitable „secondary” offer so that they will actually become customers, or at least subscribe before leaving our page. Let’s see what a „secondary” offer actually is? A „secondary” offer is a message that the visitor of the website has not yet encountered yet (because they did not land on the appropriate pages, did not get to know the offer in more detail, etc). With this „secondary” message we can make our visitors think for a minute and consider our offer when it appears – this message is usually on a popup overlay. This case study is aimed to present the success story of a well-known and recognized international cosmetics company, AVON. AVON’s case study illustrates the fabulous results that an online store can achieve with versatile offers, continuous changes, and testing. Due to the continuous testing, renewal of campaigns and the versatile, active popup communication, the number of orders coming from traffic redirection campaigns was 150% higher in 2017 than at the same time the previous year. NOTE: Don’t have time to read it now? Would you like to save it for later? Download the PDF version for free! AVON is an international company present on the market for more than 130 years. The primary scope of the founder David H.McConnell was to create an opportunity for women to earn money without having to neglect their family. He assisted them to generate an independent income, helping them feel independent beside their traditional roles, those accepted by society at the end of the 19th Century. This work opportunity spread all over the World within a short period of time, but most importantly it gave more freedom to women. Nowadays there are millions of women representatives in the World selling AVON’s products. The company’s Hungarian subsidiary began its activities in 1990, and its unbroken success lies in the thousands of Hungarian AVON representatives that they have today. Although AVON still believes in the power of direct sales, when its online store was first launched, the company took into consideration the requirements of the modern era. While AVON has been selling on the more developed markets (ie: USA, United Kingdom) online for years now, the company only launched its Hungarian ecommerce site in November 2013. Nowadays, in many countries, one can search between the products and buy online easily from home without having to contact the representatives. AVON’s online store pays special attention to customer satisfaction. Just as offline buyers have differing needs, so do online visitors. Therefore, the biggest challenge for AVON is to treat every visitor equally and help them find the offer that they are looking for. Having thousands of visitors a day makes it difficult to monitor the behavior of every visitor. It is particularly challenging to identify in which section of the buying process the individual visitors are at. In order to attract more buyers to the store in future, the first aim was to build a newsletter list. This way there would be a higher chance that those visitors who did not find what they were looking for will become buyers with the help of individual newsletter offers. If we are talking about online stores, unfortunately, the cart abandonment rate is a constant issue. This was the case with AVON as well: in spite of the fact that some visitors reached the stage where they put one or two products into their cart, the majority of these visitors decided to abandon their cart in the last moment (before payment). Since its first launch, the site has been hosting regular campaigns that offer periodic discounts to its visitors. In order to maximize sales, it is very important for AVON to draw the attention of its visitors to these periodic campaigns. The main aim of AVON was to be able to communicate the right offer at the right time. They were looking for a solution that helped them track the ever-changing visitor behavior to be able to display tailored offers to their future customers. Given that onsite retargeting seemed to be very efficient in reaching the above goals, AVON decided to choose OptiMonk in 2015. Not only did they make sure about the efficiency of the system with the help of the trial period but they also ensured that they can work together with the support group efficiently. As already discussed previously, the visitors of the online store have different goals: in spite of the fact that some of them are willing to buy immediately, the majority of them are not yet ready to buy. The latter are mostly visitors who are not committed enough to make a purchase during their first visit. However, in spite of this, it is important to emphasize that they are interested in the products, so they can become future customers. This was the scenario that AVON faced. Their visitors fall into two major groups: the first one consists of women who are ready to buy immediately, whereas the others are „only” collecting information for future purchases. The major difference between the two target groups is that those belonging to the first group put the product into the cart right after checking it and are interested in the shipping details, whereas the behavior of those belonging to the second group differs. They typically spend less time on the page, view less pages and do not even get to the cart or checkout page. So they do not make immediate decision and are not committed enough to buy. In case of visitors who are not yet ready to buy, the aim is pretty straightforward: we have to persuade them to provide their email address. This way the newsletter list will only contain people who will later convert into customers with the help of educational materials and special offers. Let’s take a closer look at some of the campaigns that contributed to building AVON’s newsletter list! Building email lists was not a new goal of AVON as there has been a signup form on the page from the very beginning, albeit a relatively hidden one (one can sign up at the footer of the webshop). This alone, however, did not bring the expected results, so the primary aim was to increase the conversion rate of the signup form. In order to achieve this, AVON offered an incentive, a special offer to those who provided their details on the signup page. This was possible with the help of an attention-grabbing campaign, and making sure that the offer was constantly changing. Below you can see the two versions of the campaign as an illustration. After clicking on the CTA button, the visitor is returned to the signup interface and she receives the coupon code via email – through this offer, we could ensure that only valid email addresses were collected. In order to reach out to the most appropriate target group, the popup appeared on exit intent on PCs and was timed on mobile devices. Those visitors who already visited the signup confirmation page were excluded – this way they did not sign a visitor up twice. During the campaign, they were able to save more than 10,000 visitors. Apart from the conventional popups, there are other opportunities to make visitors sign up for the newsletter. The sidebar is one of them – it is a newsletter signup module placed on the side of the page. The sidebar can be placed either on the right or on the left side of the webpage – and it will stay there as long as the visitors are navigating the site. Its advantage is that we do not disturb our visitors while they are reading an article or searching between our products. Once they have finished browsing the page, they can sign up to the newsletter anytime. Because of this, it is a very effective and elegant method of collecting email addresses. AVON knows well that the conversion rate of visitors coming from different places can vary as they have various goals when they land on the page. Because of this, the sidebar only appeared in case of traffic sources from which visitors that were „not ready to buy yet” came from. Therefore, only visitors coming from Facebook, Google search or Google AdWords campaign could see the sidebar. Studies suggest that the World’s population now uses mobile devices more than Desktop PC’s for browsing the internet. Although in the more developed Western and Far Eastern countries – including Hungary – traffic coming from Pcs is still higher, the number of visitors coming to online stores from mobile devices is increasing. Due to this, mobile browsers deserve special attention. The campaign has conditions similar to the sidebar presented above. Thanks to this, AVON managed to collect the details of more than 300 new subscribers in 14 days, which is an excellent result! In order for a potential buyer to arrive to the buying stage, an ecommerce store has to make many small steps towards building the trust of prospective customers in the right order and in the right time intervals. We have to persuade them to become interested in our product/service. In other words, we have to help them progress along our well-established sales funnel. Placing the products into the cart is a very important stage of the road leading to the ultimate goal, the purchase. However, even at this stage, there can be a significant churn rate. We have been working with online traders for more than ten years now and what we have seen so far is that regardless of the store’s performance, decreasing the cart abandonment rate is the number one priority for most ecommerce store owners. This is understandable since there is a long road ‘till someone arrives to the cart subpage and it can really hurt to lose our visitors gained through hard work, so close to our ultimate goal, even in the case of a company with such a big reputation like AVON. Therefore, it is not surprising that recognizing this opportunity, AVON has started to dedicate special attention to re-engage visitors with a high cart abandonment rate. What is really impressing in AVON’s case is the way in which they realized this. Given that the visitors of a certain category can also differ, AVON realized that it is not enough to only identify those visitors who are abandoning their carts. For instance, the value of the product placed in the cart can also be a very important factor. Let’s think about it! If a visitor places a product in the cart that has a value of 1000 HUFs and other places one in 20000 HUF value and both of them leave without paying, we are talking about cart abandonment in both cases. However, the loss from letting these two potential customers go will differ. This does not mean that we have to choose between the two visitors – it just means that we have to differentiate them and communicate with them accordingly. The right time: Exit-intent – because we show the message to those who attempt to leave the page without completing the purchase process. At this point, the visitors do not differ. The right visitor: Those who have a product in their cart. This is a common aspect as well. However, at this point, AVON’s campaigns consider another important aspect as well- the cart value. The right message: As it is the cart value that differentiates the visitors, the offer has to differ as well in order to avoid a greater decrease in income by making the segments of every stimuli move. Let’s take a closer look at AVON’s campaigns! AVON segmented their cart abandoning visitors based on their cart value. They tried to persuade the visitors whose cart value was below 3500 HUF to order products at least for 3500 HUF and in exchange, they could buy the shower gel costing 1099 HUF for 199 HUF only. With this campaign, they were able to convert 16.99% of their visitors. In other words, the returning rate of the cart abandoners and those who took AVON’s offer into consideration was 16.99%. AVON listed those visitors into the second category of cart abandoners whose cart value exceeded the 3500 HUF but did not reach the 5000 HUF. Beside returning these visitors, they paid attention to increase the cart value as well: the most suitable popup was trying to persuade the visitors to order for at least 5000 HUF and in return, they could get the body scrub costing 1699 HUF with a 70% discount, only for 499 HUF. We can see that in case of a higher cart value the value of the product offered with a discount was higher as well. The campaign only appeared to those whose cart value was higher than 3500 HUF but lower than 4999 HUF. The previous campaign settings are similar to the settings of the campaign that was only activated when the cart value did not reach the 3500 HUF limit. As a result of the campaign, 12.35% of visitors who were planning to leave their cart changed their mind. In the last group of cart abandoners, AVON listed those visitors whose cart value exceeded the 5000 HUF limit but did not reach the 10000 HUF one. AVON tried to persuade them to order in at least 10000 HUF value by offering a 2499 HUF perfume for only 759 HUF. Every other campaign setting is the same as those campaigns’ that only appeared below 3500 HUF and between 3500-5000 HUF cart value. With this campaign, AVON was able to save 14.83% of their cart abandoning visitors. The three campaign reflects another important difference apart from the cart value: the message. We can see that visitors with a higher cart value can buy more expensive products on a discount price. In case of a cart abandonment campaign, the cart value is an important aspect. It can be effective if we adjust the coupon value to the cart value. Given the fact that AVON defined three segments, the company could show offers that the visitors could not miss, offers that were tailored to their purses. With the coupon, AVON did not just persuade its visitors to complete the checkout process, but by binding their offers to the value of the products visitors bought, paid a special attention to increase the cart value as well. Additionally, the visitors could only use the coupon to a certain product that they had to pay a minimal amount for. As a result, they increased the commitment of their customers towards their brand, making sure that their products won’t become worthless for their customers. 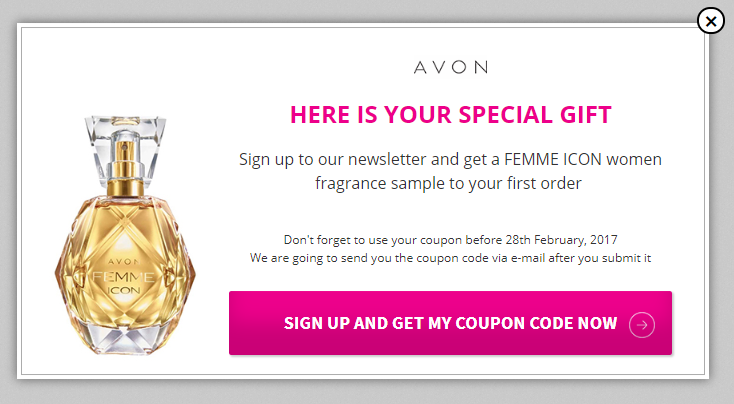 AVON dedicates a special attention to keep their visitors on their site by offering new surprises regularly (which helps in turning them into returning visitors as well). AVON creates special offers throughout the year – there is no week in the year when they don’t offer something new to their visitors. 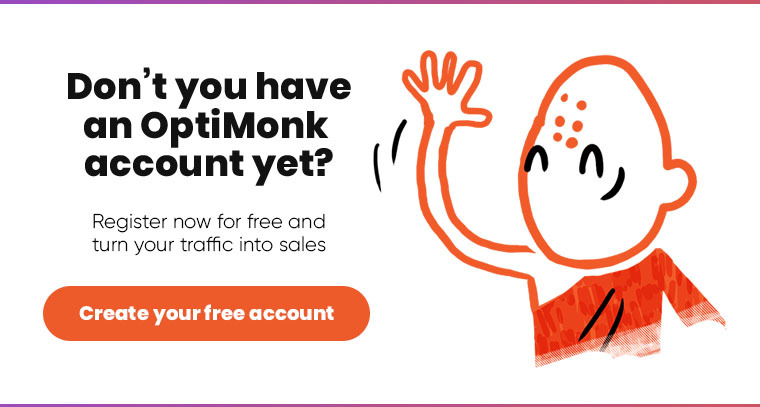 OptiMonk plays an important rule when it comes to strengthening campaigns because, besides many other goals, OptiMonk can be very useful in grabbing the attention of visitors with seasonal campaigns. In recent years, Black Friday has become more and more popular in Hungary, therefore, nowadays one cannot find an ecommerce store which doesn’t participate in the Black Friday hype in some way. AVON uses OptiMonk to Re-engage visitors since 2015 and they are creating campaigns ever since for the Black Friday period. Regardless of the discount period, they always have a teaser campaign before the major campaign. With the help of this campaign, they inform their customers in advance about the discount(research suggests that more and more customers are looking forward to Black Friday consciously). In 2017, they started their Black Friday campaign with a newsletter popup. The campaign was active for five days and AVON reassured their visitors that they will be notified on the Black Friday discounts in time in exchange for their data, using the campaign as a bait. It has to be highlighted that in order to build their brand, AVON was not afraid to play with the words, using the “Beauty Fridays” campaign name instead of the classic Black Friday to name its campaign period that lasted for several Fridays. During this period, AVON collected no less than 3770 subscribers. The Beauty Fridays period lasted between 9th and 15th November 2017. Following the preliminary newsletter campaign, AVON placed 3 different campaigns on the website, all of them encouraging the visitors to order. They appeared to conform to the various visitor segments correctly. AVON knew that if the visitors do not order from them during the Black Friday period, they will order from another online store, so they did everything possible to encourage their visitors to buy. Since cart-based segmentation was working well for AVON previously, they used it again and made two different segments, making them dependent on the cart value. Those visitors who attempted to abandon their cart with a cart value not exceeding the 3500 HUF during Black Friday could order a CC Corrector with a discount if they proceeded to the checkout. Additionally, given that it was the holiday season, they have received a shiny rolling pin as a gift. This is an exemplary product tying because the gift perfectly fitting into the holiday season reminded the visitors on why they really arrived to the page: most likely because they were looking for a Christmas gift for one of their loved ones. With the Season of Advent near, AVON offered a nice kitchen utensil as a present to its customers. The success of the campaign can be best illustrated with its conversion rate: 22.81% of cart abandoners completed the checkout process and clicked for a coupon code. The test confirmed that the offer from the right side was 5% more popular, so they decided to go on with this campaign (they stopped the other one). Following this, everybody who attempted to leave the page with a cart value below 5000 HUF received a new night cream as a gift if the cart value exceeded the 5000 HUF and the visitor used its coupon code. It is important to emphasize here that they already referred back to the previous teaser campaigns with the help of the design elements – this way, helping the visitors to connect the campaigns. We can see in this instance as well that in case of a higher cart value, the value of the offer was higher as well: while in case of lower cart values, the cart abandoners received a significant discount, those who ordered for a larger value received a valuable product for free. Supposedly this (as well) played a major role in making the campaign more effective: 33.27% of cart abandoners clicked further to receive the coupon code. The aim of the above traffic redirection popup was to direct the attention of each visitor towards the best offers – regardless of the fact that they were already subscribers or not. Those who clicked on the button landed on a landing page created for this occasion only where they could choose between the various discounts and coupon codes. In short, they wanted to increase indirect sales with the help of this campaign. With this campaign, AVON could convert 16.88% of their visitors in 6 days, which meant no less than 19171 clicks. Children’s day is becoming more and more important in Hungarian culture from year to year. AVON took advantage of this and created the below children’s day popup where visitors can attend a prize game after ordering a perfume. With the help of this campaign, AVON made a kind gesture to their customers’ children as well. With this traffic redirection popup, AVON wanted to promote a landing page that they hoped to bring more sales in 20 days prior to Children’s day. With the help of the campaign (that played a major role in increasing the chance of immediate sales), AVON managed to persuade more than 10% of their visitors to check the special offer which meant more than 1000 clicks in less than 3 weeks. NOTE: Would you like to save the case study for later? Click here and download the PDF version for free! Through AVON’s example, we can see the effectiveness of renewing the existing offers from time to time. This makes the surfing process more exciting and increases visitor commitment – as a result of which we can make more customers. Due to the campaigns targeting the newsletter and subscription pages, the subscription list grew with thousands of new subscribers. The cart abandonment rate decreased by a significant 16.5% as compared to the period before using OptiMonk. Thanks to the ever-renewing traffic redirection and seasonal campaigns, the number of orders completed via OptiMonk increased by 150% in 2017 as compared to the previous years. The results speak for themselves. If you would like to know more, create a FREE OptiMonk account and see the results for yourself!